What do you think of the prices of porcelain dolls? Not a problem bobo. No need to apologise. It will be interesting to see what the new Cinderella brings on ebay. I am astonished she is expected to go for around the 100k mark!! I don't know if she will actually fetch 100k. It seems that there are so many amazing porcelain bjd artists popping up that an Enchanted Doll doesn't seem so exclusive anymore. But hey, if someone is willing to pay so much for Cinderella then all the better for Marina. Unfortunately for most who covet one of her dolls, they will be even more shut out because of the astronomical prices. A $2000 doll would be an accomplishment for me, it could happen but my husband might have a coronary if I spent that. We just bought a house so it won't happen for awhile. I could never spend $10k plus on a doll. I think Cinderella looks gorgeous so far and will be watching the auction even if I'm not bidding. Ebay prices do not accurately depict the actual market price of an item. When two or more people get into a bidding war, the piece will obviously go to the highest bidder, the individual with the largest amount of disposable cash at the moment but, should they turn around and put it back on Ebay in a couple of months, it is doubtful it would fetch the same price or better. There are many porcelain BJDs on Ebay and some of them are selling for a fraction of their original cost to the first owner. I try not to get into a bidding war if I can avoid it as when emotions rise, the voice of reason and sanity go out the window. Being an artist myself, and knowing a bit of what goes into making a doll like this, I think the prices are justified (in most cases). Creating something like this is hard work, and if you use quality materials, it is expensive. It is also extremely time consuming. These artists deserve a fair wage, just like everyone else, and I think it's nice to see that at least some of them are getting it! Walk into many Fine Art galleries and small sculptures and ceramic items will go for many tens of thousands of dollars due to the name of the artist. You cannot base the price of an artwork on cost of materials or time spent on the artwork itself alone... I remember getting to watch a very famous watercolour painter work on a portrait, she whipped the piece out in a few hours, the paper itself (even if you bought the most expensive brand on the market) and the amount of paint would have cost at most a couple hundred dollars. Se told me the piece would eventually fetch about 20K. 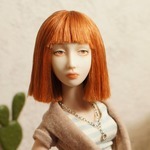 Many people are struggling to separate the thought of "craft" and "art" when considering the price of a porcelain doll. If the maker and the audience consider the completed doll as pertaining to the exclusive realm of fine art, then even a 100,000 doll would be a "decently" priced item, considering what many contemporary paintings go for. A doll under 10,000 would be considered an "affordable" artwork. A 2,000 doll is child's play. The demand for the artist will be the most important factor in dictating what the piece sells for, and sometimes a clever gallery manager. When I bought my first doll from Marina I was so used to visiting Fine Art exhibitions every week and seeing the soaring price of artworks in galleries that whilst expensive for my own meagre pocket, I knew that in the grander scale of the Art world, her doll was incredibly cheap. Even now, with her latest doll reaching 60K on e-bay, at an auction house, that's not *that* much. I also see many Blythe re-paints going for 1-3 thousand dollars now if the customizer has earned themselves a name. 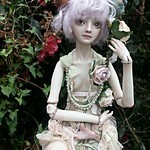 I think a whole jointed porcelain BJD going for a similar price is in comparison, very well priced. Well, Melacacia's Blythe doll repaints have topped 4000 USD, if not 6000 USD on eBay, and resold on eBay for as little as 400 USD. Blythe doll repaints have gone down in price, even the ones done by certain famous repainters besides Melacacia. Many remained unsold on eBay and some of those famous repainters don't even do repaints any more. A gallery can offer "art" at whatever price they choose but that does not mean that very art gets sold for that price or even gets sold at all. Plenty of auction houses are selling "art" that fetches bargain prices from overpriced bankrupt galleries that have gone under. Also, "art" goes up in price when the economy is good and people have disposable income to spent on eye candy. When the economy is bad, like now, hmmm... not so much. Anyway, I agree that 1000-3000USD is more than fair pricing depending on the artist. Hi everyone, what i want to say that when i first started making dolls it was in 2009 i first sold my doll for 700euro, and at that time ED were about 1000dollars, i thought my price was good at that time. Nowadays new artists sell there first dolls and start from 1000 and more and i think this is not fair. And what is most important, is to sell a quality doll! As for me, i started making good quality dolls only now after years and years practice. My prices now start from 1.500euro to 2500euro for the new porcalain dolls and 300euro for the new resin line. I agree with you, fragile dolls, while artists have a right to set their own prices, they should consider the quality of the doll. There is a huge demand in this industry for quality and a refined product. That is different from the OOAK polymer clay type art dolls, which is where many artists come from I gather. I think while the artist is perfecting their work they should either not sell the doll at all or charge a low price. I know many artists make dozens of versions of their doll before even contemplating selling them. I think that makes sense for their brand image, although it does require months or years of practicing without getting any money back. There are a few dolls I have seen on eBay that are what I would consider a beginner level doll with asking prices over $1k. It doesn't make sense, and the dolls don't sell. Which is sad because I imagine it discourages the artist. While if they lowered their price they could maybe make a sale, feel encouraged, get their name spread, and have some more funds to put into their next project. On a different note, I was thinking about doll prices and resale value. From what I have seen it is rare for a doll to sell secondhand for more than the original price, unless it's an Enchanted Doll. Some Paperwhites sold on eBay lately for $600-$800 (I think), and they must have been at least $1000 for the first owner. I see some similarly price-reduced secondhand dolls on there now. Hopefully as the hobby grows people will be able to retain their investments. But it's also kind of a nice thought, that we know this risk and we buy the dolls anyways. It means we are truly buying them for ourselves to enjoy. While an Enchanted Doll might be bought solely as an investment. I agree with you. And ED was the first and they put a lot of money in the business, so it costs a lot and bought as an investment. 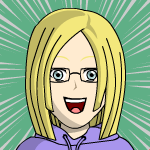 But she is not the only one in bjd... I think soon we will see some more artists of this level and price . I hope you are right! I want other artists to have the same success as Marina. I agree with you Allurose and Fragile Dolls. There are some really talented artists emerging, who will be as successful I'm sure. AAArgh- Paperwhites for sale and I missed them? The one I remember best was a few months ago, not long after you got yours. She was one of the Miss Poppy series. I considered getting her but she looked very similar to my my Alisha with her redhead coloring, so I let her go to another. This is a very interesting topic! 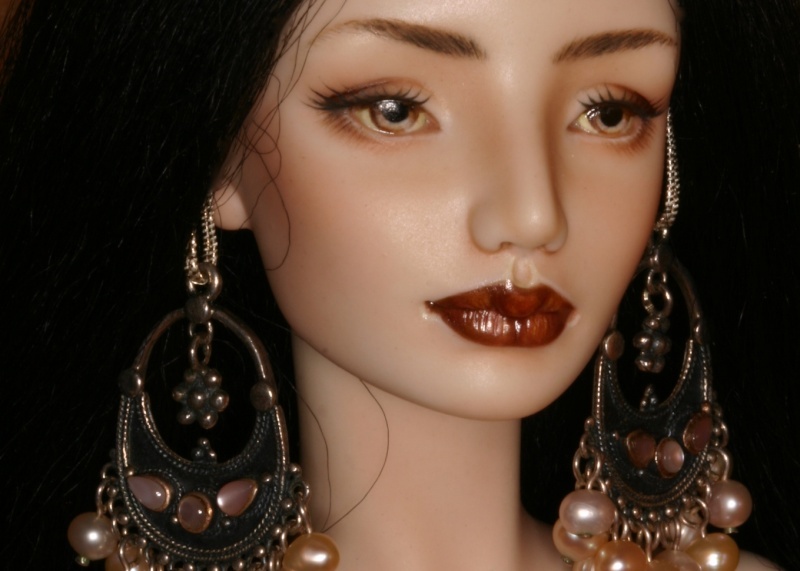 All bjds are expensive, but I try to buy only pieces that seem to me like true pieces of sculptural art. I have yet to own a porcelain bjd and the prices are quite high. I do believe that doll can be art and I am thankful that the art I love is somewhat attainable. For example, I have no desire to own a Picasso or Monet and those art pieces are unattainable. However, the things I like at the moment--like Popovy Sisters--are attainable. I think with porcelain dolls selling between $1000-$5000 it just means I can't buy everything I "like" and will be forced to carefully think about only buying things I "love" every once in a while. I buy things I love and have no expectation that I will ever be able to recoup my full costs on the secondary market. Having said that, I do I hope I can find an up and coming porcelain bjd artist whose work hasn't skyrocketed out of reach yet.